When you want to install normal curtain and drapery rods, you affix them to the wall by hammering in nails to hold the hardware. While this method works fine with regular wooden or drywall window frames, aluminum windows are another story. Hammering a nail through aluminum can damage the frame, and the resulting hole won't hold a nail in securely. Take advantage of a clever tool from hardware and home improvement stores, and you'll quickly have decorative curtains on all of your aluminum-framed windows. 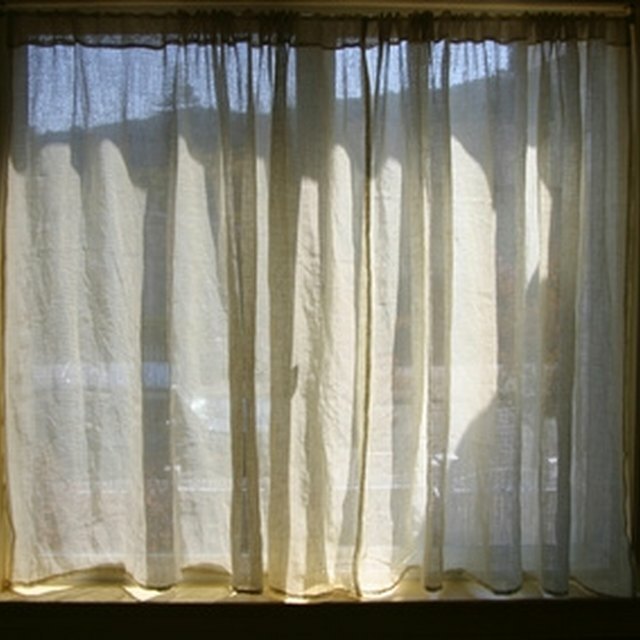 Hang curtains on aluminum windows without hammering a nail. Measure the width of the inside of your window opening. Purchase a spring-loaded curtain rod, also known as a tension rod, at your local hardware or home improvement store. These rods come in a variety of sizes, so choose the one designated for the width of your window. Thread your curtains onto the spring-loaded curtain rod. Hold the rod up with the front side of the curtains facing you. Push the ends of the rod toward the center. The spring inside the rod will collapse the rod, making it shorter. Place the rod into the window opening with the rod ends near the top of the window opening. Let go of the rod ends. The rod will try to return to its original length until the rod ends reach the side of the window openings. The pressure of the internal spring will keep the rod in place, holding up your curtains. Use this same method to install cafe curtains by placing the rod halfway down the window opening instead of at the top. These rods are made for light curtains, not heavy draperies.